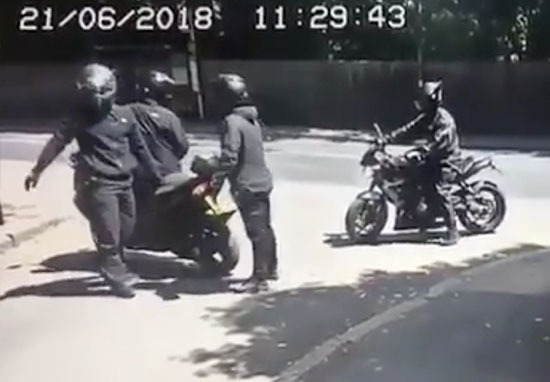 CCTV footage of two bikers in helmets showed them trying to rob a mother and child before a group of scaffolders got out of their truck and chased after the thieves. 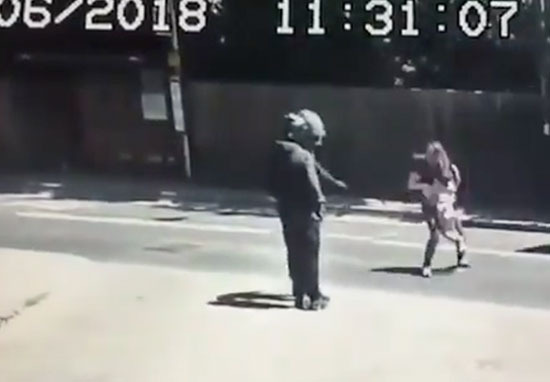 Britain’s Got Talent judge Amanda Holden shared CCTV footage of the event that occurred in Richmond, south-west London on June 21. She is appealing to try and find out information about the two masked men. The scary footage showed the men arriving at the scene on motorcycles driven by two other men, who then drove away. The men on foot stood in the shadows of the road, and walked with purpose over to the woman and child when they appeared. According to The Mirror, the men demanded the woman gave them her jewellery, threatened her and suggested they had a weapon. The mother reacted quickly; she picked up her child and backed away into the road, where cars thankfully came to a stop around her. The two men walked quickly away in the same direction that the motorcycles had gone. Seeing the distressed woman in the road, a lorry came to a stop. 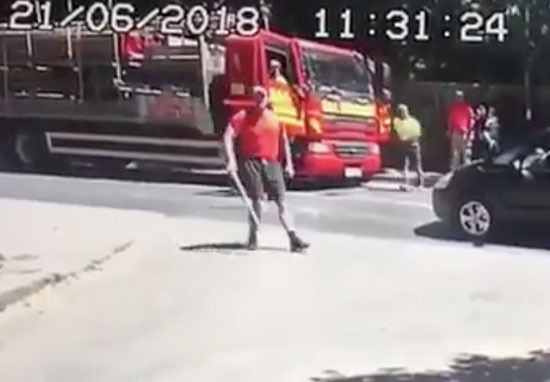 A group of men jumped out, one grabbing something from the truck which is thought to be a piece of wood or a metal pole. The scaffolders can then be seen chasing the thieves down the road. So this I know is happening everywhere but this was Sandpits Road Tw10 -21st June 12;35 broad daylight. Mother and child attached. And some #Heroes in a lorry chased them off. 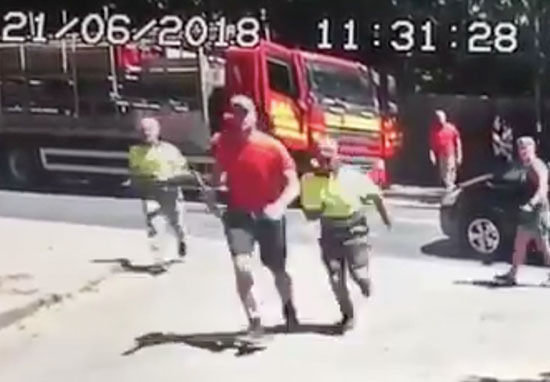 Call 101 or 999 if u know these scumbags..
Viewers of the video took to social media to praise the men from the lorry for coming to the woman’s aid. This lorry drivers are heroes. Reacting like they did. The Lorry Driver deserves a bloody medal!! God bless the scaffs ?? This lorry drivers are heros. Reacting like they did. ?? Sandpits Road is next to several schools, including Strathmore School, The Russell School primary school, and the German School in Richmond. The road is also next to The Richmond Golf Club. When the footage first emerged there was panic that the men were trying to abduct the child, but it has been confirmed that the situation was an attempted robbery. The Russell School released a statement to reassure parents the incident was not an attempt at child abduction. Just to make you aware of a recent police incident in Sandpits Road, Petersham, that may have caused some concern to parents/guardians if it has been mistranslated as an attempted child abduction on social media or described third hand in the playground. At approximately 12:35 hours on Thursday 21st June 2018 it was reported to police that four men on mopeds tried to take a baby from a mother. This was not the case, it was in fact a robbery where the four suspects on mopeds made threats towards the mother and her small child in an attempt to steal her valuables. The mother ran off and the suspects were chased away by some nearby members of the public. This matter will be investigated further by the local CID. Police have confirmed an investigation surrounding the incident is underway. A Met Police spokeswoman addressed the situation. Police are investigating an attempted robbery in Richmond. 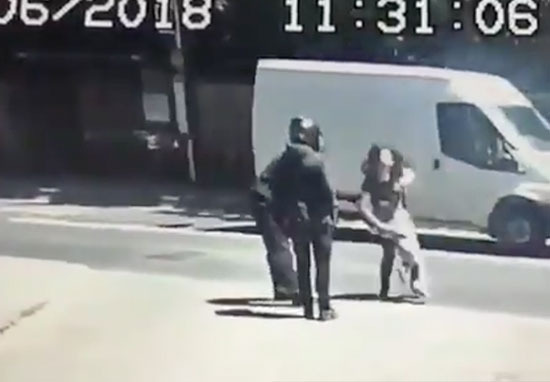 Police were called at 12.35pm on Thursday, 21 June to Sandpits Road in Petersham after a woman was approached by four men on a black moped and motorbike who demanded her jewellery. They threatened her and a young child who was with her. No injuries were reported. No weapon was seen, although it was intimated. Members of the public went to the woman’s assistance and the suspects fled empty-handed. The suspects were all wearing black clothing. Any witnesses or anyone with any information is asked to call police on 101 or contact via Twitter @MetCC quoting reference 3542/21Jun.